This elastic has an improved quality over other brands that can be visually seen and experienced Narrow extra strong nylon construction. 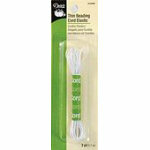 Use for stringing beads or on doll baby clothing. 5 yard package. 4 packages per box. Purchase by the box. First Available June 2010.